David Beckham is by far the most famous football players and a classy guy like that want to crowd of his fans . David Beckham is always the center of attention , not only due to its mega popular and beautiful appearance , but also due to the presence in the body for more than 30 tattoos. 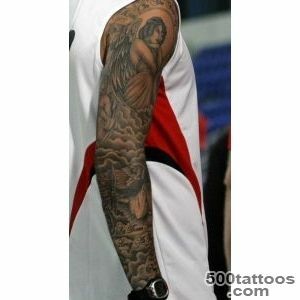 Values ​​its diverse tattoo ,but they are all devoted to his three main passions: football , faith and family. The values ​​of the tattoo on the body is not a football player keeps a secret . The lower back is a tattoo with the name of his first son - Brooklyn (Brooklyn Joseph Beckham). Name middle son - Romeo (Romeo Beckham) - David placed just below the neck ,and the name of the youngest Cruz (Cruz Beckham) immortalized in the middle of the spine . 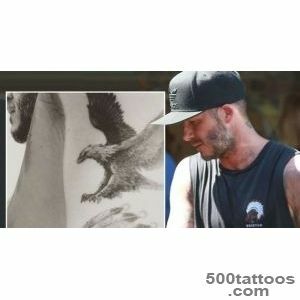 "Guardian Angel " - a figure with outstretched arms , tattooed between his shoulder blades David Beckham . This tattoo was later expanded by the addition of large wings . Above the clavicle is the name of the baby Harper (Harper Seven Beckham). 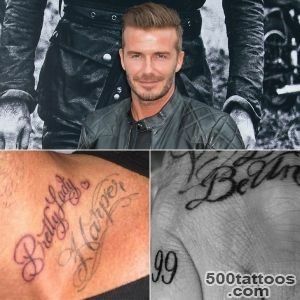 Beckham loves his wife ,Tattoos and many are associated with it . On the left hand is written the name of Victoria in Hindi, located below the word love in Latin «Ut Amem Et Foveam» - « I love and cherish ." On the left hand of David coated 15 centimeter tattoo of Victoria in the image of Brigitte Bardot (based on a photo taken in 2004 with the magazine cover ) . Figure David cost $ 5,000 ,and above its name - the inscription in Hebrew , "My beloved is mine, and I have loved ." Besides the portrait of Victoria surrounded by stars and phrases : . " Always there " and " Till death do us part "
Tattoos in the form of a cross with wings Beckham did at the height of the UEFA Cup in 2004 , when he , in his words , " needed help again. "On the right- hand player impaled Roman numeral VII, which was his number in the " Manchester United " . Under the figure placed the Latin words "Perfectio in Spiritu", meaning " spiritual perfection " .The appearance of the angel on the right shoulder with the inscription «In the Face of Adversity» ( « the face of danger "), Beckham explained vaguely : " Everyone has the opportunity to express their feelings , my way - a tattoo ." "Jesus in the way of the cross " - so there was a tattoo on the body of David Beckham in 2010 .It is located right on the edge portion of the body and is made under the inspiration of the painting «The Man Of Sorrows» - « Man of Sorrow" Matthew Brooks . In early 2001, it created another masterpiece of body art : a portrait of Jesus, and cherubs . 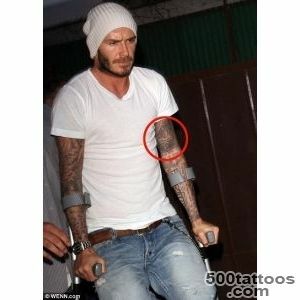 Jesus is very similar to David , which is pulled from the grave three cherubs who are the sons of David Beckham .On the left side , David Beckham did tattoo the inscription , which reads as follows Chinese wisdom : " Life and death depend on the fate and the wealth and nobility - from heaven ." On the left hand applied label , which is the word Love , it means love to the family star . Nearby is a tattoo in the form of a small swallow . While in Italy ,I became interested in the Renaissance , as a result , a new body art: Cupid brings his wife Psyche to heaven . A small change in the picture - Psyche 's naked body covered with a scarf . On the right side of the back of the palm came footballer Victoria inscription. New tattoo was made in the same style as the inscription " Love » (Love),is emblazoned on his left hand . Therefore, this action can be seen as quite peculiar declaration of love to Victoria .